For many regions, April wasn’t the warm start to spring that producers were hoping for. If the trend continues, assessing freeze damage to alfalfa might be a routine activity. 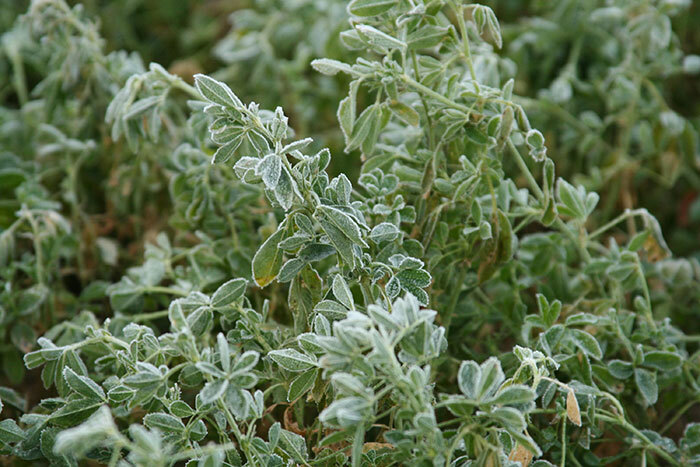 Producers are urged to give alfalfa time to recover from the effects of frost before assuming the worst. Although plants may appear in rough shape, looks can sometimes be deceiving. “To assess the extent of the damage, don’t just look for frozen or wilting leaves,” says Bruce Anderson, forage extension specialist with the University of Nebraska. “You need to determine if the growing point was killed,” he adds. Anderson explains that producers should look for the apical meristem, which is located at the top of the main stem, inside a cluster of unfolded leaves. This point is the origin of all leaf, stem, and branch growth. This growing point is somewhat shielded from the elements due to the surrounding dense leaf tissue. While the plant tissue surrounding it may be withered and dying, the inside may be ready to continue growth when growing conditions improve. “If the growing point was killed, however, growth will cease on that stem. Any new growth must come from new crown shoots or from lower branches,” Anderson says. This will cause delayed regrowth, but Anderson notes that producers will not be left harvesting the remains. Eventually the plant will begin to grow as usual and become productive. “Cutting damaged plants might accelerate the development of regrowth from a good, healthy field; however, it also adds extra stress to plants,” Anderson says. He cautions that if producers opt for a premature cutting, they will need to wait until plants are fully mature before cutting again. In the end, choosing the right practice comes down to determining the severity of frost damage. Anderson only suggests cutting a frost-damaged stand if there is enough growth to justify the time and expense of harvest. Lauren Peterson served as the 2017 Hay & Forage Grower summer editorial intern. She is from Wyanet, Ill., and currently attends Kansas State University where she is pursuing a degree in agricultural communications and journalism. While at school, Lauren works at the KSU dairy farm and is an active member of the Horseman’s Association.